Our lab is interested in understanding the regulation of p53 and its signaling pathway. As "the guardian of the genome”, the p53 tumor suppressor gene plays a critical role in maintaining genomic stability and tumor prevention. 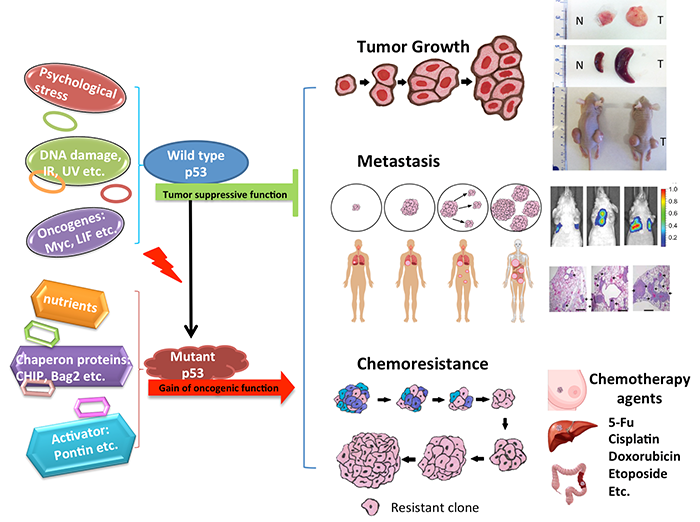 p53 is the most frequently-mutated gene in human tumors; over 50% of all tumors harbor mutations in the p53 gene, and over 80% of tumors have a dysfunctional p53 signaling pathway. The p53 protein responds to a wide variety of stress signals. 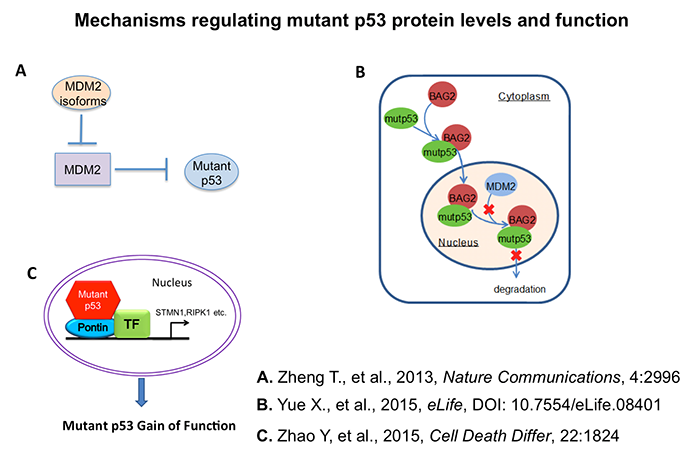 As a transcription factor, once p53 is activated it selectively transcribes a set of target genes to initiate various cellular responses to prevent the propagation of cells that could potentially become cancerous. In particular, we are interested in the connection among chronic psychological stress, p53 function and tumorigenesis. For cancer patients, both diagnosis and treatment are stressful events. 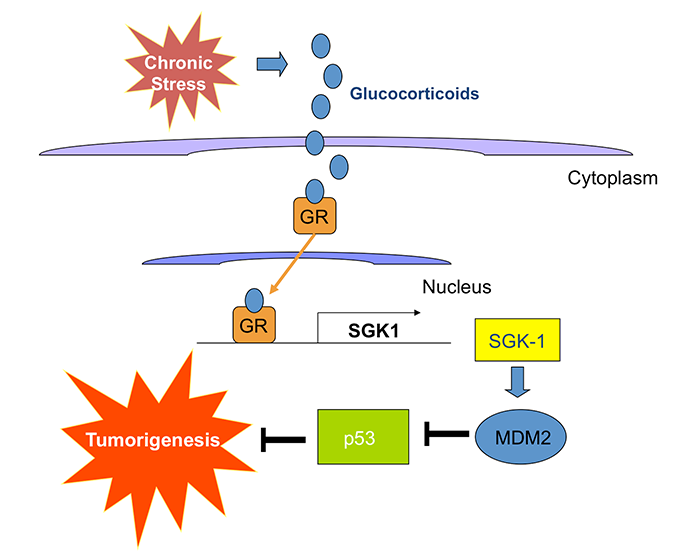 Our research suggests that chronic stress attenuates p53 function, which provides the foundation for future studies on stress level monitoring and p53 activation as an important potential intervention strategy for cancer patients. The overexpression of tumor-associated MDM2 isoforms in tumors interacts with full length MDM2 to inhibit MDM2-mediated mutp53 degradation. We identified a novel mutp53 binding partner, Pontin, that plays an important role in promoting mutp53 GOF through regulating the transcriptional activity of mutp53. I identified an important p53 function in addition to tumor suppression; p53 plays a critical role in embryonic implantation and maternal reproduction through the regulation of a novel p53 target, LIF, in mice and humans. This set of work for the first time demonstrates the important physiological role of p53 and its pathway in reproduction in vertebrates. 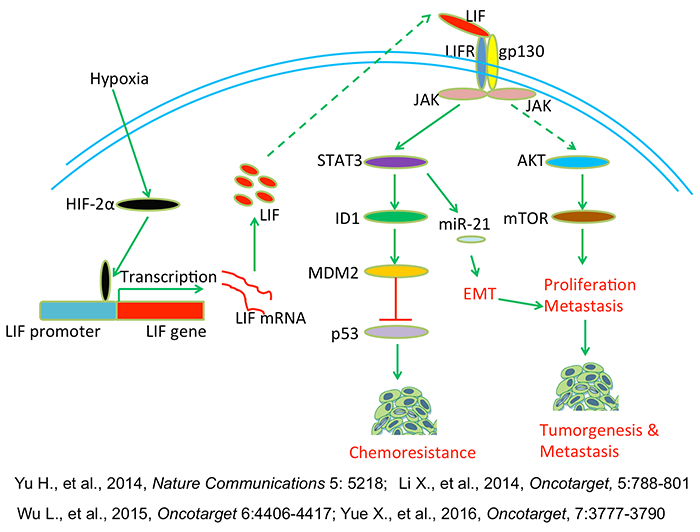 Hypoxia can induce the LIF expression levels, which could be an important mechanism for the frequent overexpression of LIF in human tumors.